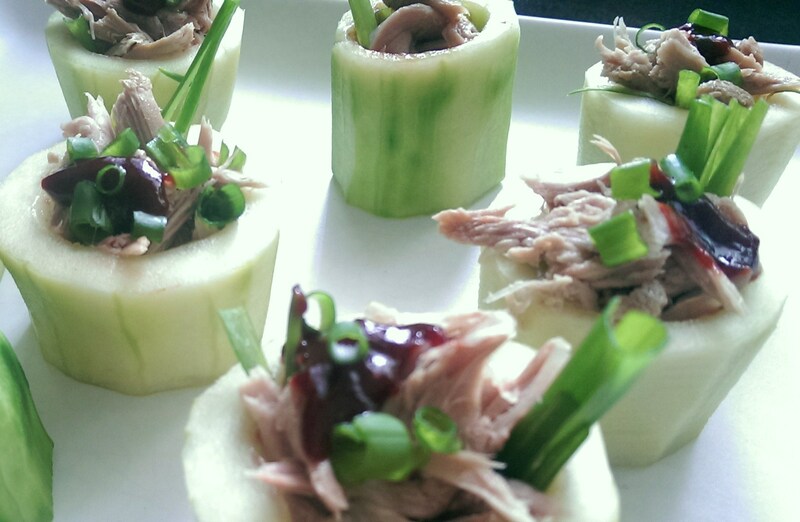 This is a canape version of the Duck with Hoi Sin Sauce in Pancakes often found in your local Chinese restaurant. 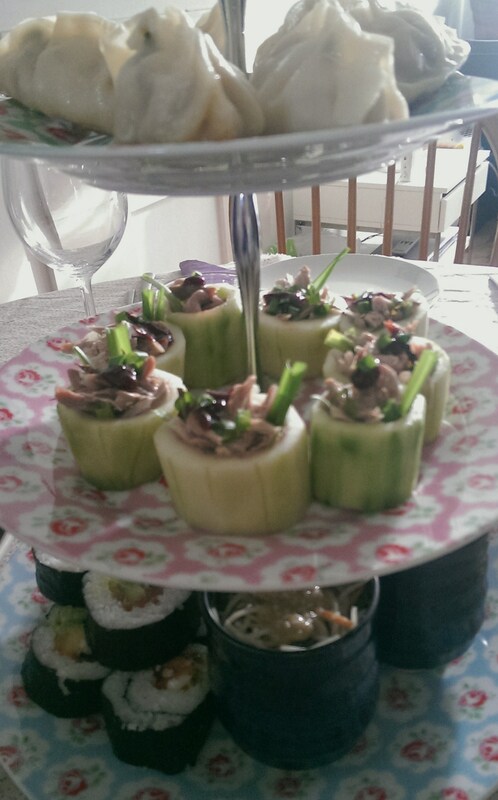 Created as part of an ‘Asian Inspired’ Afternoon Tea. I’ve previously used a similar recipe for Braised Duck with Spring Onion Pancakes, it’s a healthier version of crispy roast duck as it does not involve deep frying. This canape version is a little fiddly but looks impressive. Cucumber: Peel the cucumber and cut into two inch cups. Scoop out most of the watery seeds in the middle but leave the bottom intact so the filling doesn’t fall through. Combine the vinegar, water and sugar in a large shallow dish and put the prepared cucumber cups in to pickle. Leave for up to 1 hour, but longer if you want it to be really sharp! Take the duck out of the braising liquid and shred the duck meat finely. Pat the cucumber cups dry and assemble onto a serving dish. 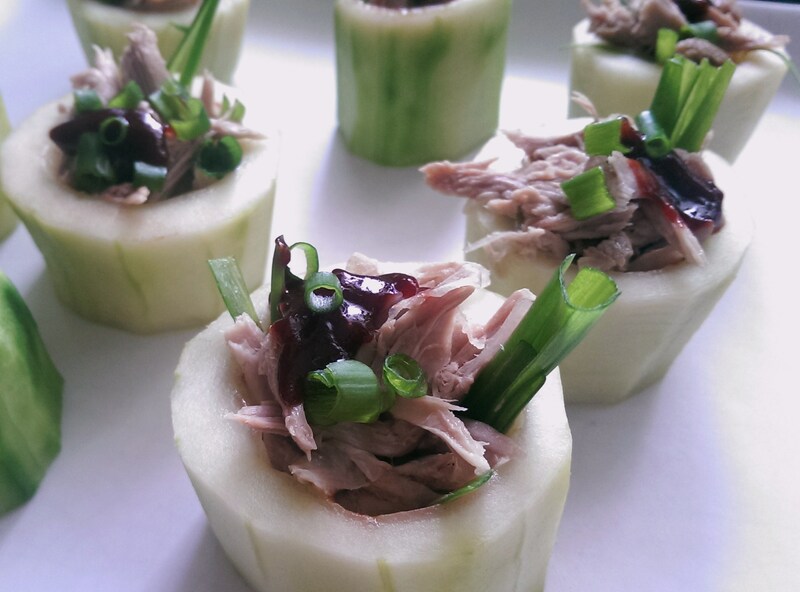 Spread a thin layer of Hoi Sin Sauce in the bottom of each cucumber cup, then stuff a big pinch of duck into the cup. Finish off with a small dollop of Hoi Sin sauce and the spring onions.